Perfect for baby shower as a keepsake place baby's picture in frame after the baby is born. I placed each frame in a pink organza bag with candy! Happy face was drawn on pink paper and placed inside the frame. The cardboard on the back needs to be plastic for secure hold. But the shower was a success. These were the perfect favor for the Baby Shower!! Too glad that we ordered this. it was such a hit that we had to save a few for ourselves and our relatives back home. Absolutely recommended for baby showers. great idea for a favor giveaway. Just wish it came in the organza bag that was shown on website. Make it, Bake it or Buy it! I added these frames to a baby favor package that also had a little "pitter patter" baby foot cookie cutter. They were both packaged in a small favor gift box and it was such a cute baby gift. My cousin is having her second baby. Since the children will be close in age there will not be another shower and she already has so much. I wanted to do something different and fun so I made 12 favors that she could hand out at the hospital or at home when people came to visit her to celebrate her new arrival. The frames were the perfect compliment to the baby foot cookie cutter! Used these as hostess favors at my sister's baby shower. They were extremely adorable, but small. The colors where unique and nice. I wrapped them in an organza bag with a thank you ribbon and "thank you for attending" within the frame. A big hit with the guests! Add cute as a button soap to go along with this frame. Too cute to resist indeed! The best picture frame keepsake for our little button. Cute as a Button is a "winner"
Thought the frames were adorable. Made well. Only wish that the frames were a little bigger. Might be tough to find a picture small enough to fit. These were adorable favors! 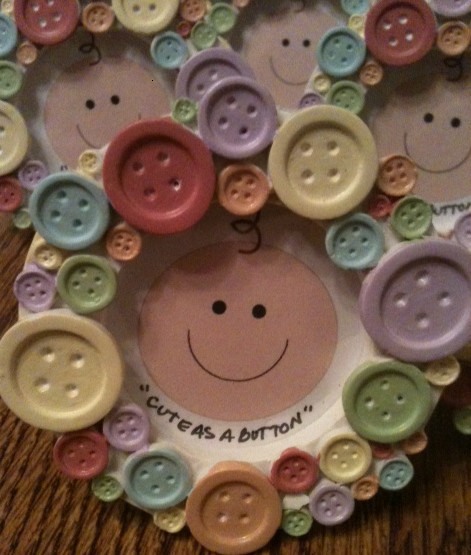 I downloaded a cute baby's head and wrote "Cute as a button" under it and put that picture in each frame. Just the touch it needed! Then I bought the organza bags and you could see the baby picture and frame through the bag. So darling!!! Perfect gift at a baby shower/luncheon. I put pictures of the mom-to-be in the frames, and placed them at each place setting. When the baby is born, they all will then have the perfect frame to display our beautiful baby! Perfect mini size favor. Adorable! The baby shower theme is "cute as a button" so these frames were perfect. Have not had the shower yet, but I know everyone will love these. They can put a pic of the new baby in them! Adorable and as cute as pictured. Loved the pastel colors of the buttons. Perfect for a baby shower. Wished the backstand was plastic and not unfinished cardboard. Put baby pictures of the expecting mom and dad at all placesettings for guests to take home. Given as a thank you for the baby shower. They were a great find and good quality. I am having a baby shower for my daughter, and the theme is "cute as a button".....so, when I saw your picture frames, I knew that it was the perfect favor. These are really cute as a button. Exactly what I expected - did not disappoint! Would be great for a baby shower or little girl party favor. We used this product as giveaways for a baby shower. It was very simple, but very cute and all the guest loved it. We added ribbons to the back of it to give an extra touch. all in all great buy. We used these frames as a keepsake for a babyshower and the guests loved them. Nice and colorful to go with any theme. [...] I am very happy with my purchase and would use this site again and again. Using the frames for favors at my daughters baby shower, Love this product. will be a boy and a girl...worked with both. The cute as button picture frame is good quality and yes cute as a button. Would have liked it if they were a little bigger but very satisfied. Using for a baby shower. As a gifts for baby shower vistors. It can be used for a boy baby shower or a girl. This is going to be a shower give away. Hopefully my grandson will be the picture displayed in the homes of the winners. Q:WHAT IS WEIGHT OF THE ITEM? A:The weight of this item is 1.5 ounces. Q:What is the size of pic? A:Holds one 2x2" diameter photo. does this item come with a packaging? and how does it look like? A:This item does not come with packaging designed for presentation. They will either be wrapped in paper or packed in a cardboard box that is not suited for presenting to guests. We recommend using our sheer organza bags (#1101) or goodie bags (#2695). Tiny, round and too cute to resist! There's a reason these "cute as a button" place frames are a hit at baby showers around the country! Use these colorful frames as place card holders or give as baby shower favors with a special message or photo tucked inside the round photo opening. Each frame features resin buttons in a variety of sizes and pastel colors. Frames include a "For You" insert and measure approximately 3" in diameter. 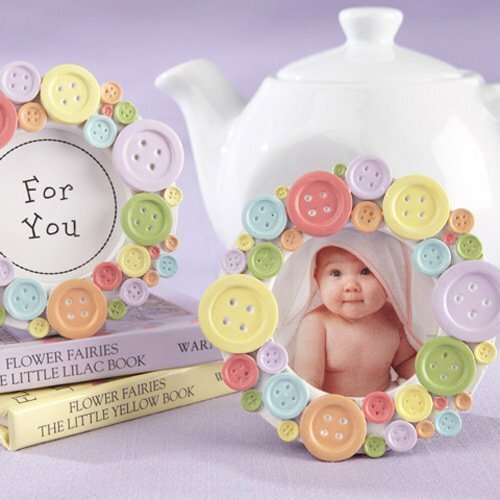 If you think these baby-themed cuties are hard to resist, you'll also adore our cute as a button soaps and mini rocking horse picture frames.